The Temple of Dawn | Let's Go for a Trip! 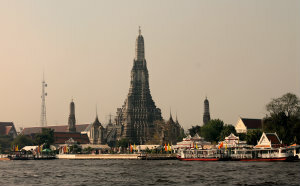 The Temple of Dawn (Wat Arun) is a named after Aruna, the Indian God of Dawn. The temple enshrined the Emerald Buddha image before it was transferred to Wat Phra Kaew on the river’s eastern bank in 1785. The towers are supported by rows of demons and monkeys. Very steep and narrow steps lead to a balcony high on the central tower. The circumference of the base of the structure is 234 meters, and the central prang is 250 feet high. Tip : If you wan to climb up the steps, make sure you don’t wear skirt if you do not want to expose yourself to those below you!